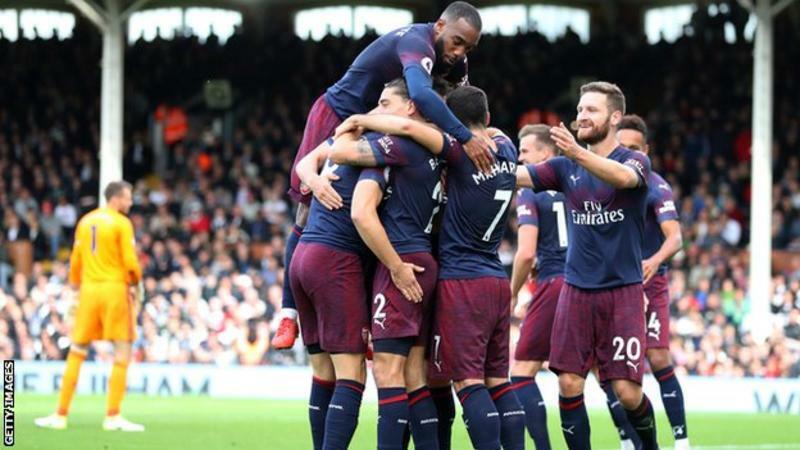 And then the streak of winning continued for Arsenal on Sunday afternoon as they saw off a Fulham side at Craven Cottage. The lunchtime fixture which was filled with goals contributed by both teams moved Arsenal’s tally to nine straight wins in all competition this season and also shot us to third place on the league table before Chelsea recorded victory against Southampton. As we have seen since the appointment of Unai Emery as manager at Arsenal, we had a very strong team. Leno started in goal in the absence of the injured Petr Cech, Alex Iwobi got a place in the first eleven while Mesut Ozil missed out with a back injury. The skipper for the day was Granit Xhaka. It did not come as a surprise to see Iwobi in the team following his impressive performance in recent weeks. The Nigerian man did not disappoint after all, for his combination with Danny Welbeck helped mount pressure on our opponents. In fact, he featured in the buildup to the opener which Alexandre Laczette sharply tossed past the goalkeeper. The cross which led to the Frenchman’s 150th club career goal was provided by Welbeck. We were made to know that there was need for us to sit up when just a minute to the close of the first session Andre Schurrle chipped Leno to grab the equalizer for a side who would later regret dashing Arsenal hopes of going back home with a clean sheet. It did not take Arsenal so long to prove a point in the second half as we restored our lead a while after Hector Bellerin’s edge-of-the-box strike failed to go into the right place. Again it was Lacazette. The striker perfectly connected with Welbeck’s headed pass then fired a screamer from outside the box to make it 2-1. The great tactics of Unai Emery led to more goals for the Gunners as the substitution of Aaron Ramsey and Pierre-Emerick Aubameyang later paid dividends. Ramsey whose future at Arsenal looks bleak has barely spent a minute on the pitch when he ensured that the efforts of players involved in that counter attack did not go in vain by scoring what was arguably the goal of the afternoon on the ground. Aubameyaang, also a substitute, assisted by Bellerin, made it four with his left-footed shot into the corner of the net. It became a brace to his name in injury time having been played through by Ramsey to gift Arsenal the fifth and the final for the day. It ended 5-1 making it nine wins in the last nine on all fronts and six consecutive victories in the last six in the Premier League. Hopefully, October will be another great month. Arsenal go into the international break heads high with such a superb stat. We won’t see them in action for the next 14days due to the break and by October 22, it will be Leicester City visiting the Emirates Stadium to see if they will be able to put an end to our unbeaten run. Until then, have a nice time. FUN FACT: Lacazette who wears number 9 scored in the 29th and 49th minute.